Japan will be my home for another week, it seems, as the window which we thought would give me a good run at getting clear of Japan this week is now not looking good at all. Japan’s island situation means that stable weather at this time of year is pretty hard to come by as it is influenced by so many different areas. Lee (weather router) reckons that there could be a nice little window on the 2nd May – no westerly winds but a gentle set from the south. It is a bit of a gamble going with southerly winds as it would mean my course out from Choshi has some degree of north in it which means that the time it will take to get out to the Kuroshio current will increase and I will be in the shipping lanes for longer. 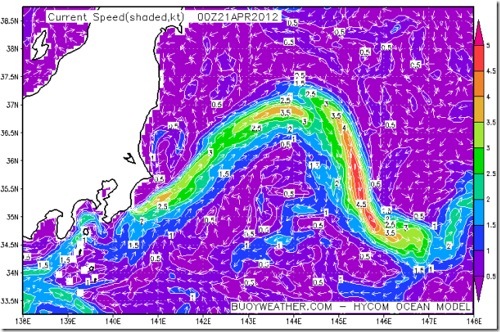 Yet with no westerly winds forecast for a couple of weeks, the 2nd could be a really good option. We shall stand by some more and see what happens. This picture below is the Kuroshio track at present – a snaking current which runs up the east coast of Japan and out into the Pacific. It will be useful at times and not at all at others. If I can get into it after a day or so then it will help me run clear of the coast. The numbers are in knots (nautical miles per hour) so you can see that at times it is whizzing along! The Kuroshiro Current : it will be super useful at times and not so at others. Ric will be leaving later this week as he has other commitments that he cannot postpone, but it has been wonderful to have him out here to help with the final boat tinkering and the mammoth job that was packing Gulliver. He is almost ready now – all the gear and food has been waterproofed and stowed and lashed down. Treats and letters and photos have been hidden around the boat and I have squeezed as many delicious extras as I can into the tiny gaps. I shall continue tinkering until I leave – but it is really just the detail now. There is one good thing about waiting for the weather – and that is that it gives more time to rest, to sleep to be 112% happy with everything. We shall continue to monitor the weather and update right here and through Twitter (@SarahOuten) so do keep an eye on it all, especially if you are thinking of coming out to say cheerio. PPS: A huge thanks must go to the fantabulous staff at Choshi Marina, the lovely Kaz Ebata and Kay Tsubaki, the Choshi Weather Bureau and Choshi Coast Guard who are all being so helpful. And then to the Tokyo crew – Tari and Mike and Kelly and Kaz, for keeping me entertained! The boys (your fans from Tokyo) are tracking all your preparations, but they are not entirely convinced you will fit all your food in Gulliver! We wish you the best. If you find yourself making a trip into Tokyo while you way, just drop us a note- a home cooked meal awaits! Good luck on the next leg Sarah. Will be following you with interest, internet connection in inner Mozambique permitting!! We are all thinking of you and hope the wait is not too long to get going. Very impressed with your storage of all that gear/stuff/chocs etc! You are sure to have a few surprises in there ?! Gute Reise! Komm gut an! Not long now! Wooo hoooooo!